East Africa Uganda, 12.08.2009. 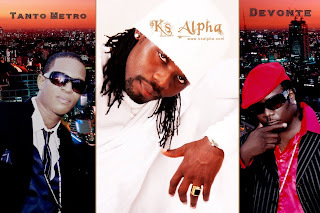 Uganda’s dancehall sensation KS Alpha presents his new production with the Jamaican Dancehall Group “Tanto Metro & Devonte“. The Song was released on Aug 7th, 2009 on Hot 100 FM, Sanyu FM, KFM, East Africa Radio and Capital FM. The song is produced by Henry Kiwuwa at No End studios. The song which was release a week ago has already entered the Monitor Newspaper Scoop Top 10. “It’s a blessing working with one of the best in the genre of dancehall music worldwide; Tanto Metro and Devonte.” KS Alpha said. To bring closer the energies of the two dancehall acts, a performance video is currently being shot in Jamaica and Uganda and will be ready by late September 2009.